Haneke was speaking at a press conference at Walter Reade Theater ahead of “The White Ribbon”‘s screening at the New York Film Festival last night. The film, which won Haneke his first Palme d’Or at Cannes earlier this year, takes place at a rural school in the north of Germany as the pre-WWI seeds of fascism begin to unravel. One of the school’s teachers (played by newcomer Christian Friedel) comes to believe that a series of deadly accidents may be the work of one or more of his strangely withdrawn pupils. Haneke told journalists, via a translator, that he did little rehearsing on the set of “Ribbon,” despite the massive cast (as moderator Richard Pena noted, it’s not just an ensemble, it’s “like a whole community”). Haneke shot “Ribbon” in black and white, a choice that drew curiosity from those at the press conference. “It was very clear to me from the beginning that I wanted to shoot the film in black and white,” Haneke responded, claiming two different reasons for this choice. 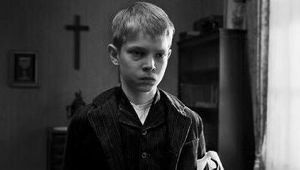 A scene from Michael Haneke’s “The White Ribbon.” Image courtesy of Sony Pictures Classics. The highlight of the press conference came when a journalist asked Haneke if he has “some abiding sadness in [him] that produces this kind of drama… this ethos on the screen.” The rest of the audience burst into nervous laughter. “I’m looking forward eagerly to seeing they respond,” he said simply, smirking. “The White Ribbon” screens again tonight at Alice Tully Hall in New York City, and opens in theaters this December care of Sony Pictures Classics.